That's where this tutorial comes in. 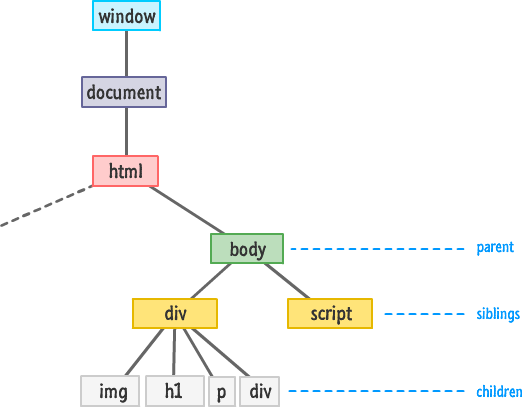 To help you understand how to easily navigate from branch to branch (basically, like a monkey), the DOM provides you with a handful of properties that you can combine with techniques you already know. 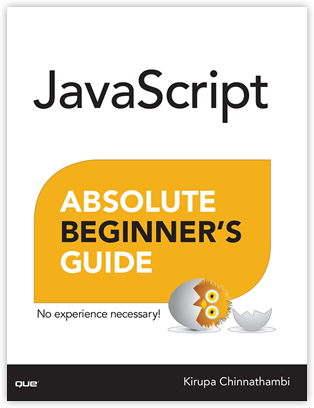 This tutorial will give you an overview of all that and more. Before you can find elements and do awesome things with them, you need to first get to where the elements are. The easiest way to tackle this topic is to just start form the top and slide all the way down. That's exactly what we are going to do. One thing to note is that both window and document are global properties. You don't have to explicitly declare them like I did. Just shake and use them straight out of the container. 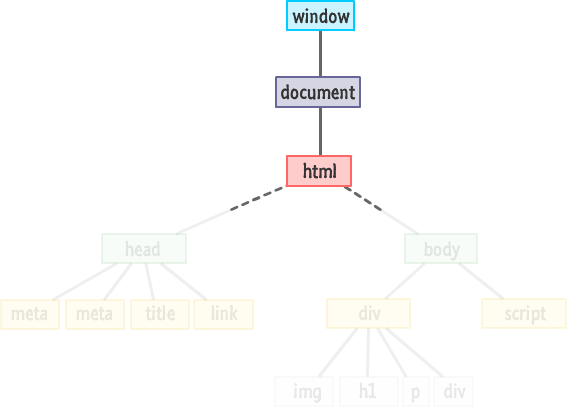 Once you go below the HTML element level, your DOM will start to branch out and get more interesting. At this point, you have several ways of navigating around. One way that you've seen plenty of is by using querySelector and querySelectorAll to precisely get at the elements you are interested in. For many practical cases, these two methods are too limiting. Sometimes, you don't know where you want to go. The querySelector and querySelectorAll methods won't help you here. You just want to get in the car and drive...and hope you find what you are looking for. When it comes to navigating the DOM, you'll find yourself in this position all the time. That's where the various built-in properties the DOM provides for going all The Motorcycle Diaries will help you out, and we are going to look at those properties next. Both the div and script elements are siblings. The reason they are siblings is because they share the body element as their parent. The script element has no children, but the div element does. 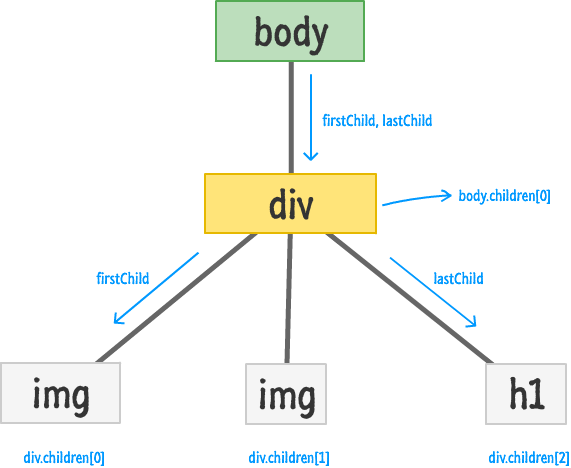 The img, h1, p, and div are children of the div element, and all children of the same parent are siblings as well. Just like in real life, the parent, child, and sibling relationship is based on where in the tree you are focusing on. Almost every element, depending on the angle with which you look at them under, can play multiple familial roles. To help you through all of this, you have a handful of properties that you will rely on. These properties are firstChild, lastChild, parentNode, children, previousSibling, and nextSibling. From just looking at their names, you should be able to infer what role these properties play. The guy in red with the pointed pitchfork is in the details, so we'll look at this in greater detail next. This diagram is a little busy, but you can sort of make out what is going on here. The parentNode property points you to the element's parent. 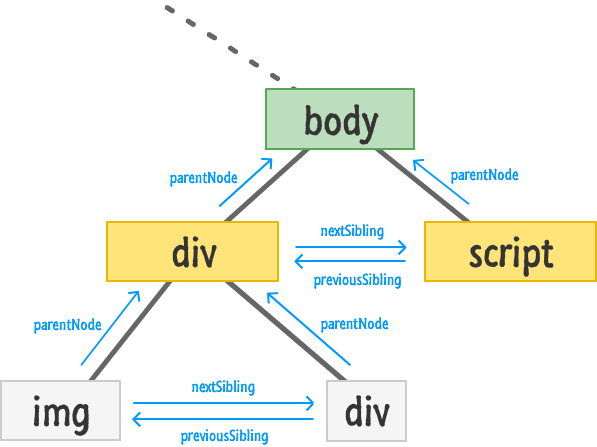 The previousSibling and nextSibling properties allow an element to find its previous or next sibling. You can see this visualized in the diagram by just moving in the direction of the arrow. In the last line, our img's nextSibling is the div. Our div's previousSibling is the img. Accessing parentNode on either of these elements will take you to the parent div in the second row. It's all pretty straightforward. The firstChild and lastChild properties refer to a parent's first and last child elements. If the parent only has one child, as is the case with the body element in our example, then both firstChild and lastChild point to the same thing. If an element has no children, then these properties return a null. This if statement will return null if there are no children. You could also have used bodyElement.lastChild or bodyElement.children.count if you enjoy typing, but I prefer to just keep things simple. Notice that I am using the children and length properties property just like I would an Array. The thing to remember is that this collection is actually not an Array. Almost all of the Array methods that you may want to use will not be available in this collection returned by the children property. In this example, we are calling theDOMElementWalker function on an element referenced by the texasRanger variable. If you want to run some code on the element that this script found, replace my commented out line with whatever you want to do.